We've been seeing prototypes and hearing reports about a hopped-up version of the Lamborghini Aventador, but only now have we seen something official from the company. It's officially called the Lamborghini Aventador SVJ, and the company teased it in the above trailer of the car at the Nürburgring. It gives us our best look yet, and some tidbits about what we'll hear next about the car. Let's first address the looks. The front fascia has been revised with a much deeper chin and a big wing splitting the main air intakes in the front. The side skirts are wider with end caps at the forward sections behind the front wheels. Those wheels have motorsport-style single center nuts. In one of the trailer's clips, we can see they're wrapped in Pirelli P Zero Trofeo R tires. It also has the outrageous rear wing we've seen in spy shots, and the exhaust also sits high up like on the Huracán Performante. Finally, while not necessarily part of the looks, we get a look at the instrument cluster that reveals this Aventador has a redline of roughly 9,000 rpm. The other part of the trailer to address is the location. The whole trailer takes place at the Nürburgring, and there's usually only one reason to make a big deal about that: lap times. 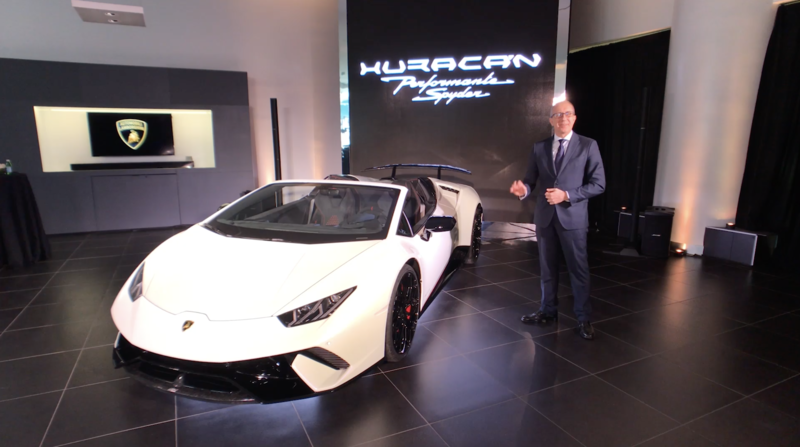 Lamborghini already proved it can make some wickedly fast track cars with the Huracán Performante, a car that laps the infamous track faster than any other Lamborghini (so far) and faster than even the Porsche 918 Spyder. We expect the Performante's left-right split active aerodynamic system will appear on this car. Add to it much more power from the V12, and we have a potential 'Ring monster. Rumors even suggest the Aventador SVJ will have a lap time of around 6 minutes, 45 seconds, faster than the 911 GT2 RS. The SVJ will probably be much lighter than other Aventadors, too. The Twitter post that features the trailer says something slightly ambiguous about having "the best weight to power ratio." We assume that means the best of any Lamborghini. Since this is a teaser, we're expecting to see a more full-fledged video in the near future, hopefully with at least lap time, if no other specifications. Also, the fact that Lamborghini is showing this much of the car now is a sign that a full reveal can't be far away. The Paris Auto Show would be a natural location since it's early this fall. Stay tuned for more in the near future.